Chiang Mai ("New City") was founded in 1296 by King Mengrai as the capital of the first independent Tai state, Lanna Thao (Kingdom of One Million Rice Fields). It became the cultural and religious center of the northern Tai, those who had migrated from southern China to dwell in Thailand, and remained so throughout the turbulent period of recurring Burmese attacks. The Burmese finally captured Chiang Mai in 1556 and occupied it until King Taksin recaptured the city in 1775 and drove the Burmese forces back to the approximately present border. 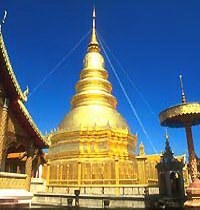 Burmese influence on religion, architecture, language, cuisine, and culture, however, remains strong. Local princes, chao, remained in nominal control of the city, though they deferred to the king of Siam in Bangkok. In 1874, King Chulalongkorn (Rama V), concerned with encroachment by the British (who had teak-logging interests as occupiers of Burma) and fearful of a conflict with them, sent a commission to Chiang Mai, which eventually limited the power of the local princes and brought the Lanna kingdom further under the control of the central government in Bangkok. In 1939, the city was formally and fully integrated into the kingdom of Thailand, becoming the administrative center of northern Thailand. In 1996, the city celebrated its 700th anniversary. In the last half century, the population of the city has grown rapidly, so that it's now Thailand's second city, with a population of more than 200,000. With this growth have come the attendant problems of air pollution, rush-hour traffic, and water shortages, though not quite nearly as bad as Bangkok, as well as the displacement of tribal people in the nearby hills and valleys to make way for the development of retirement and vacation-home communities. It would be difficult to find a city that reflects more of the country's diverse cultural heritage and modern aspirations than Chiang Mai. Tour buses crowd Burmese-style wats ablaze with the color of saffron and humming with the chanting of monks. Traditional open-air markets sell handicrafts, produce, plastic utensils, and motorcycle parts. Narrow streets lined with ornately carved teak houses lie in the shadow of contemporary skyscrapers. Chiang Mai's heart is its Old City, an area surrounded by vestiges of walls and moats originally constructed for defense. Yet Chiang Mai as a whole is a modern city, with the usual advantages and disadvantages. No visitor to Thailand should miss it. Because of its temperate climate (similar to the hill stations in nearby Myanmar), many Thais choose Chiang Mai as a summer retreat during March, April, and May, when the rest of the country is wilting under the heat. Its central location makes Chiang Mai an excellent base for exploring the north of Thailand. Country Code--The country code is 66 for Thailand. Area Code--The area code is 053 for the Chiang Mai region. ATMs--For ATMs and money changers, go to Chang Klan Road and Charoen Prathet Road, around the night market, for the most convenient major bank branches. Bookstores--There are a few with a good selection of English-language novels and travel books. The best is Suriwong Book Centre, 54/1-5 Sri Dornchai (tel. 053/281-052). D. K. Books, 234 Tha Pae Rd. (tel. 053/251-555), has a good selection as well, but beware-they have a "store policy" 3% credit-card surcharge. Dentist/Doctor-The American Consulate will supply you with a list of English-speaking dentists and doctors. There are also several medical clinics; check with your hotel about the best and nearest facility. Emergencies--Dial tel. 199 or 191 in case of emergency. Hospitals--in Chiang Mai hospitals offer excellent emergency and general care, with English-speaking nurses and physicians. The best private hospital is McCormick on Kaeo Nawarat Road (tel. 053/241-107) out toward the Arcade Bus Terminal. Internet--If you're looking for a good Internet cafe, there are a few around, especially in or around guest houses in the Old City. Assign Internet has two branches, the most convenient across from MacDonald's in Chiang Mai Pavilion at the Night Market on 145/23 Chang Klan Rd. (tel. 053/818-911), with another branch outside the northwest corner of the Old City at 12 Huay Kaew Shopping Center, Huay Kaew Road across from Central Department Store (tel. 053/404-550). Pharmacies--There are dozens of pharmacies throughout the city; most are open daily 7am to midnight. Police--For police assistance, call the Tourist Police at tel. 053/248-130 or 191 (nation-wide), or see them at the TAT office. Post Office--The most convenient branch is at 186/1 on Chang Klan Road (tel. 053/222-483), with another branch at the airport 053/277-382). The General Post Office is on Charoen Muang (053/241-070), near the train station. The Overseas Call Office, open 24 hours, is upstairs from the GPO and offers phone, fax, and telex services. Rest Rooms--Large hotels and most restaurants have public rest rooms. Outside the city, small restaurants may charge 2B for the use of an Asian toilet. Bring your own toilet paper.